Recently I found on a certain online auction website something I wasn’t aware existed. Of course, I made an offer and absconded with it before bidding could commence in earnest. No, this is not proper etiquette, but had I not done it, someone who might be more inclined to drop it into a box and forget about it might have found a way to redirect the package it came to me in to their address, instead. Thus, it is safer with me, who would be about to publish a short article with pictures of it for all to see and enjoy, and for the the sheer posterity of it. Who am I kidding? I’m trying for a complete set and got surprised. I got lucky that the seller was cool with the idea. Usually it doesn’t work. As soon as I met with success I began a web search (for a whole hour!) sniffing under every digital stone and dirt clod on a mission for any mention in web history. I did in fact dig up such a truffle – a listing on worthpoint.com referencing another old listing on the same auction site. The listing was for a generally brand new, in the box plane without a spot on it. It was beautiful, much more attractive than my messy rescue. But, get this – the listing it referenced ended sometime in 2006. As of this post, that was a full decade ago. Something smells scarce here, an odor which is far more enjoyable when wafting from my personal toolbox than it does emanating from that of another – in those cases, it gets mixed with the acrid tang of …jealousy, I think, which I find to be somewhat less enticing than the subtle vanilla/cinnamon bun/oatmeal cookie overtones of the rare. It’s a Millers Falls 17B, which until a short while ago was a totally unknown variant to me. I say variant, but I actually mean model. It might have a 1 5/8″ iron, an adjustable mouth, cam locking lever cap, and be 7″ long just like the older 17, but it has the completely different cutter depth adjustment that the 16C does. It doesn’t even accept the same irons as the 17 – and that is really the reason why it needs to be termed a different model. It’s in a class only with the 16C and those two seem to be peas in a pod. As far as I know, the 17B is not listed in any Millers Falls catalogs. I am certain that if it were it would have been listed over at oldtoolheaven.com amongst the rest of the planes produced by the company, but alas that is not the case. Its far more numerous brother, the 16C, also is not in any catalog I have ever seen. Key sentence clause, that – “that I have seen.” If there is one depicting the 17B I am keen to learn of it. After it arrived I tried to date it according to the stamp on the cutter. I popped the lever cap off. Happily it was not rusted on and not so tight that I couldn’t budge it without penetrating oil. I pulled the quite dull, pitted iron from the familiar safety of the frog and I brushed it off. There was quite a bit of Steel Cancer adhered to the metal, so off to the wire brush it went so as to clear it. I had expected to find a long trapezoid with an empty triangle centered upon it, with the words “Solid Tool Steel” emblazoned therein. But no dice. In fact – there was no stamp at all. Nothing. It is a completely blank iron. I’d like to say that I have never seen this before, but that would not be true. 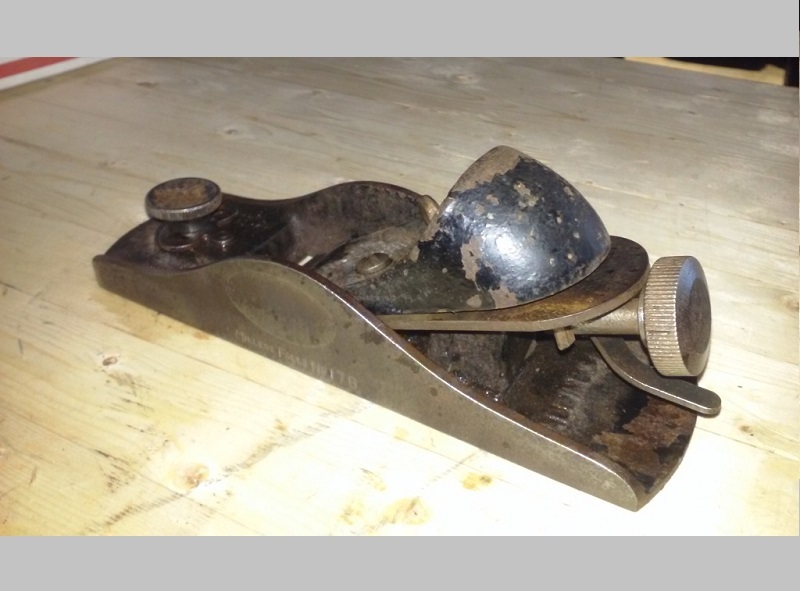 I have a Millers Falls No 65 scraper (the one with the wooden sole) and its iron also is stamp-free. I question its originality. But I don’t question the originality of this iron. After all, where would a replacement have come from? None of my other MF irons will bed in this plane. I think they’re afraid. Long story much shorter than the above: I need information. Anyone know anything about these? The unstamped iron. Too bad it’s so pitted near the cutting edge; this will likely be a shelf unit unless a replacement iron can be sourced. Next to a standard 17. The bedding angle looks shallower on the B but I think that’s just a trick of perspective. It looks like it is supposed to be the normal 20 degrees. And next to a few more… the 17B, 17, 57, and the 16 for comparison. Previous post Making the dw infills: Lets do some tapping and peening.